Replaced 2 new alternator and still battery dies.Replacing the battery makes the problem solve but new battery only lasts few days,say 3 to 4 days and after that it dies. Very serious issue.One of our customer at our garage faced these kind of frustrating problem with his 2002 Ford Windstar vehicle. First inspect the fuses under hood. In these particular case the problem looked like it was fuse. We removed all the fuse one by one. But after removing fuse number 103 and 119 under hood,the problem seemed to be solved a bit. Its not necessary,that in your case also these fuses will solve the issue.May be it will be some other fuse. But after few days same problem returned as it was before.We all ready replaced these both fuses with new fuses,but the problem was same as before.It only lasted for a day or two.So as for further troubleshooting,.We have to remove each and every part fuse panel to confirm where the problem lies. Now its clear that some of the component or fuse is draining the battery or making the battery gets short and dead internally.So you will have to keep the volt meter handy.The battery voltage is approx or near to 12 volts.Remove one component at a time and view the battery voltage.If the battery voltage gets to 12 or the meter reading gets increased then you know,that particular fuse is causing the problem. Install all the fuses back into their locations. Open the driver door. Use a screwdriver or similar object to close the door latch so the vehicle thinks the door is closed. Visually make sure all the lights go OFF inside. If it has a delay, it may take awhile. Now install your meter on the battery cable. Wait about 10 to 20 minutes until everything has a chance to go to sleep. Now go under the dash and remove the fuses mentioned before one by one. Remove one. If no change in the meter reading, put it back in. Move to to the next one. and so on until all three have been tried. There was no electronic trailer brake controller installed so skip that one. If the above mentioned procedure is not helping,then you know that problem is not the fuse,but the module itself. WE had to disconnect the rear electronic module. The module is located behind the right rear trim panel. 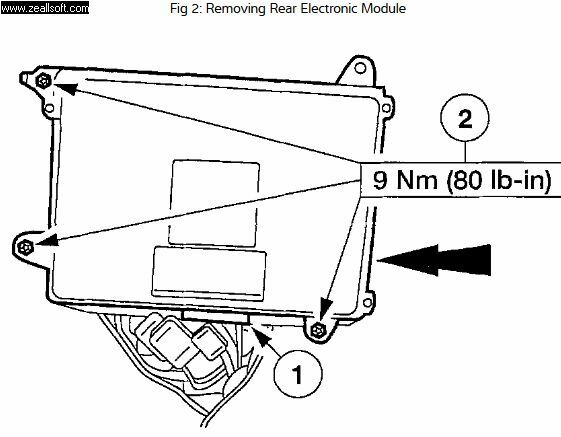 To get access to the module remove the right rear quarter trim panel. Then remove the jack mounting bracket and the REM is located behind that bracket. You don't need to remove it, just unplug it. Just do the same thing for the lift gate that you did for the driver door to make the vehicle think it's closed.Press the lift gate latch with screw driver,keeping the lift gate open. Now with the lift gate connector disconnected,measure the battery voltage and battery ampere.The voltage between battery positive and battery negative terminals and battery ampere between battery negative terminal and battery near by grounding. In these previous case the problem got solved after disconnecting the REM module. But without making the REM module connected,there are many other vehicle features that will stop working.So REM module i very much necessary. The REM is a common issue that causes battery drain. there is no easy way around replacing the REM. It controls too many things like your rear lights and turn signals. When you replace the REM you will need to take the vehicle to a ford dealership to have it set up using the factory scan tool. No aftermarket tool will do this.The Module has to be programmed by proper tool,to make it work and control all functions of the vehicle. Once we got the REM module,the problem seems to be gone. Yes these was one of the costly repair for the customer,but at least his problem is solved.We identifies the cause of problem and got it programmed by near by ford dealership. The battery drain issue is solved. 1999 Ford Taurus: Battery not holding Charge? 2007 Toyota RAV4: Battery Warning Light Flashing on Dash? Replacing Battery Cables on 1998 Lexus ES300?